The on-going court trial between Apple and Samsung has helped in opening and bringing to light loads of confidential information from both the companies. And now the latest is from Samsung who has revealed at least 2 potential Windows Phone 8 in the documents it has submitted to the court. The two devices are “Odyssey” and “Macro”, both listed under the Windows Phone OS list and are in line for a Q4 release which also lines up with the expected Windows Phone 8 release too. 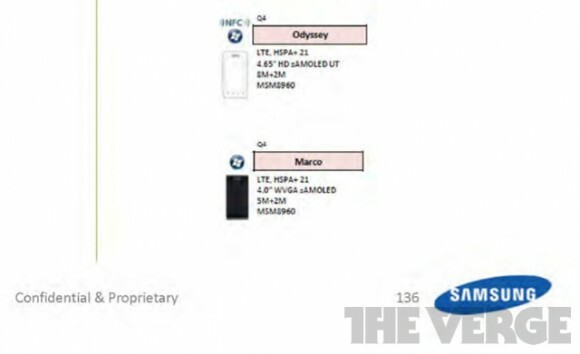 The specs the device suggest that these two smartphone might run on WP8 as both of them are said to be running on Qualcomm MSM8960 chipset, a dual-core 1.5GHz processor which Microsoft is using to test the OS. The “Odyssey” which is stated to be an ‘iconic smartphone’ packs in a 4.65 inch Super AMOLED display with HD resolution, an 8 MP shooter at the rear and NFC capability (which is arriving with WP8). Whereas on the other hand, the “Macro” is marked to be arriving with a 4 inch S-AMOLED display with a WVGA screen resolution and a 5 MP rear facing camera. Both these smartphones will be equipped with LTE radio chips thus enabling users to enjoy blazing fast browsing experience and 2 MP front facing cameras.